Earth was once a beautiful, blue planet. But that was a long time ago. After endless wars the wealthy left earth to build a civilization on the moon, while the poor people they left behind suffered beneath the iron fist of ‘the corporations.’ The corporations engineered Cyberons, bio-mechanical men programmed to hunt down corporate crime—till the Cyberons discovered that corporations WERE the crime, and so the corporate police were formed to hunt Cyberons down and destroy them…. 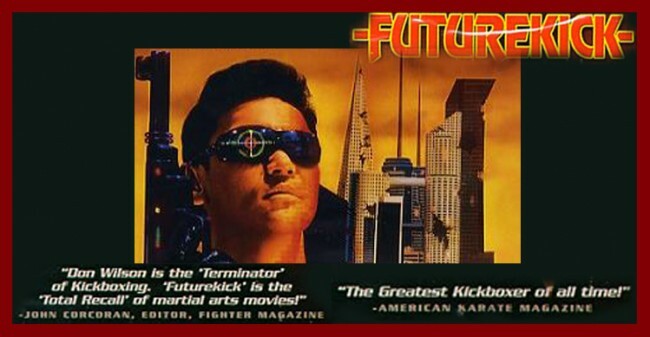 This is the basic plot set-up for “Futurekick,” starring Don “The Dragon” Wilson, purportedly the greatest kickboxer of all time. This background information is stated oh, about every fifteen minutes throughout the course of the film, so I figured I would get it out of the way and just info-dump it off the bat. You should probably also know that the cast includes Chris Penn (“Footloose,” “Reservoir Dogs”) and Meg Foster (Evil-Lyn in “Masters of the Universe” hell yeah!). This feature film provides us with 80 minutes of dimly lit alleyways, anatomically impossible organ thefts, Virtual ULTRADREAMS, a game called Laserblade, and breasts. Lots and lots of breasts. Oh, you were expecting more from this review? What else do you need to know! So Howard, computer programmer and all-around douchebag, heads down to Earth to retrieve a floppy disc from a corporate spy. A woman formerly working for New Body Corporation has proof that the organ transplant company is having Earth people murdered for their organs (shocking). Howard gets the disc, but also spends a lot of time making out with his girlfriend, going to nudey bars, and gambling on the ridiculous game of Laserblade (the loser gets their head EXPLODED BY LASERBALL). Howard gets murdered by corporate serial killer David Hynes. Hynes guts many people throughout the course of the film, some of them just random passersby. I’m not clear on how this is supposed to work, but he has a glove with three knives sticking out of it, and when he thrusts these knives into your stomach he manages to pull out your neatly snipped, wholly undamaged heart. Okay! Long story short, Howard’s widow, Nancy, comes down from the moon to investigate his death, and when the police laugh her off (“Lady, I have more than a hundred murders in my precinct EVERY DAY!”) she hooks up with the last living Cyberon, Walker, aka Don “The Dragon” Wilson. Walker kicks a lot of people, and they do a lot of investigating at stripper shows (snake stripper, motorcycle stripper, burka with a noose stripper!). It’s striptastic. It’s kicktastic. It’s FUTUREKICK. This movie has several different head explosions. It has Chris Penn leaking neon green android fluid. It has a woman wearing a ridiculously huge blue feather coat. It has a dude named Two-1 (I looked up the spelling). It even has a dude wandering around in the background for no reason wearing a flashing neon “Condom Sale!” sign on his chest. There are at least 23 breasts—one woman only gets her shirt yanked down on one side. She’s gutted. Most importantly, it has a scene in which the sleaziest guy on the planet (and that’s saying something in “Futurekick”) demands money from serial killer David Hynes. Hynes yanks down a fire escape ladder, and the ladder promptly swings back and knocks the sleazeball’s head clear off his body, with minimal bleeding. YOUR PHYSICS DO NOT APPLY IN 2025! Everyone hangs in the Zona Rosa, the Red Zone, the Hot Box, the Skin Connection! That guy behind you? He’s going to gut you. That other guy, the one wearing sunglasses at night? Obviously an android. So from the Phenomenal Cosmic Movie Column, to all you at home out there: Good night folks, and here’s hoping we don’t make it to the year 2025!